Introduction: Laparoscopic surgery through a single incision (SILS™) aims to enhance the benefits of conventional minimally invasive surgery by reducing the number of required surgical incisions. To date, SILS™ has been utilized to accomplish cholecystectomy, gastric banding, Nissen fundoplication, appendectomy, nephrectomy, tubal ligation, gastric bypass, right colectomy, sleeve gastrectomy, and numerous other procedures. 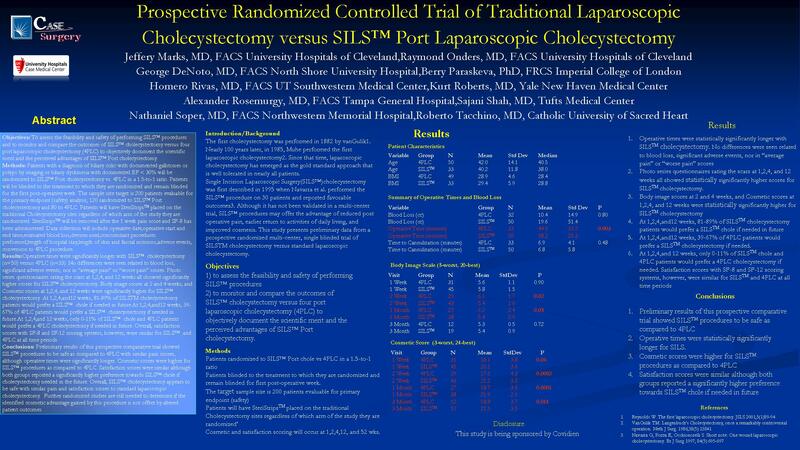 The initial experience with SILS™ suggests that it is technically feasible and safe and may offer select advantages over standard laparoscopic approaches.This is a preliminary report of an on-going multi-institutional study which we believe isthe first prospective randomized sham controlled trial, aimed at objectively analyzing the safety and efficacy of SILS™ Cholecystectomy. Methods: The study is designed to randomize 200 patients in a 3:2 SILS™ cholecystectomy vs conventional 4 port laparoscopic cholecystectomy (“4PLC”) ratio at 9 centers. All patients, regardless of randomized procedure,receive 4 bandages at conventional locations to achieve a sham design. Patients are blinded until the bandages are removed after completion of the 1 week pain evaluation. Patients are contacted by phoneon days 1,3, and 5. Patients are seen in follow upat 1,2, 4,12, and 52 weeks post-operatively. Pain intensity numerical rating scale(PI-NRS), SF-8, and body image scoring are performed at each followup. In addition, analgesic usage, surgical complications, hernia development, and wound complications are recorded. Primary endpoints include feasibility, operative time, and EBL. Secondary endpoints includepain, cosmesis, andquality of life. Preliminary Results: Between April 2009 and September 2009 twenty five (25) patients, 15 SILS™ and 10 4PLC, have been enrolled and have completed their 1 month follow-up visit. No significant adverse events have occurred. One SILS™ case was converted to a 4PLC secondary to adhesions. The mean operative time (54.9 minutes for SILS vs. 51.5 minutes for 4PLC) and mean intra-operative blood loss (16.2 ml vs. 13.8 ml) have trended similar between groups. The postoperative Pain Intensity Numerical scores at various time points are trending similar between groups at all time points.Cosmesis was evaluated utilizing three questionnaires at 1 month follow-up. Patient derived body image data indicates a positive trend for SILS™ versus 4PLC. 68% of the total patient population would have SILS™ if they had to have the procedure again. Conclusion: In this prospective randomized sham controlled trial, early results are trending towards showing that SILS™ is a safe and effective procedure with select cosmetic advantages over conventional 4-port laparoscopic cholecystectomy. It is understood that the these are early results of a small patient population. On-going enrollment and follow-up will permit a more robust scientific analysis.